I hope you are planning a follow up article on how to thank a speaker after their presentation. This transition can either keep their momentum going or sap the life right out of an excellent talk. The same person who did the introduction should be prepared to pick up on some of the key points and reinforce the message by making it relevant to the crowd. Oh, and one more thing. I’d like to see your thoughts on the art of handling Q&A sessions after a talk. These can be highly educational, dreadfully boring, or outright disasters! Andrew, thanks for writing about this often-overlooked aspect of public speaking! As one of those people whose name is frequently mispronounced, I will underline #6. I once had an introducer who introduced me several years in a row at the same event and NEVER got my name right, even after I pronounced it for her many times. Sometimes I just had to re-introduce myself. Great one there Lisa,I also had similar challenge and I didn’t take it easy at all after the event when my fans wanted to mention my name to just applaud me for my wonderful speech. I think it is good some of we speakers at times do the introduction by ourselves to help the game. Andrew, an important topic that coaches like me spend a surprising amount of time working on with speakers. Getting the introduction right means that a speaker is properly built up for that particular audience. The speaker then has credibility before starting and doesn’t have to brag about herself. I particularly appreciate your point about avoiding humor. I’ve seen far too many VPs of Marketing try to tell a silly story about spilling something on the tie of the presenter, or something equally trivial, and get lost in their own cleverness rather than put the focus on the speaker, where it belongs. 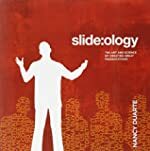 One further tip: a presenter should shake the hand of the speaker after the intro as the speaker is moving to the stage. That helps ground the speaker, and makes a visual connection with the speaker for the audience. And one last thought. We often write and produce video introductions for speakers precisely to control the uncertainty that all too often means a bad introduction, despite all the effort expended. Great tips. I would also add: Make sure you give the audience the #1 reason why they should really want to hear from this speaker. Once again…excellent! This is what I want to let each member in my Toastmaster clubs to learn to do because they generally say something comical or try to make up something or they will read a 1/2 page bio the speaker has given them and it always truns out to be awkard, borig and ineffective. I generally ask the speaker to send a 2-3 sentence bio of him/her self and to make it relevent his/her speech, but they generally do not do what is asked because they want to put everything down or nothing at all because they seem to think they are not worthy of a good valid intro. Also many have a tendency to say “without furter ado, after an invalid introduction which tends to drives me crazy. Great info from you as always and this will be my next speech at my TM clubs! Two things that are subliminal but will make the speaker appear in a power position is 1) have them come to the podium or lectern from the audience right or stage left. It adds to the first words they speak. 2) Make sure the speaker knows who will accept the lectern from them and where they are sitting. Again, shift control at the lectern with a hand shake. This closes the authority of the speaker strongly and leaves energy in the room for the next speaker or meeting closer. Thanks. Never thought about so many things whenever introduced speaker. I usually learn in advance how the speaker likes to project himself and include it in my introduction. A brief comment from Denmark. Introductions seem to be very cultural. In Denmark audiences tend to dislike lengthy introductions. We have something called the Jante Law – meaning you should not stand out – this in turn means you would avoid making the speaker shine too much. Actually Danes in general are terrible at introducing each other. Often in ordinary encounters between people – it does not happen at all. Write your own introduction and hand it to the person introducing you. Never leave this to chance. Make sure this person has good delivery skills. The introduction is your warm-up act. Thanks for this great article. It will definitively help me in the Master of Ceremony role in a Toastmaster meeting. My comment is on item 11 ‘Stick to relevant expertise of the speaker’. While it is good to keep all comments short in public speaking, for this part especially in Africa and Nigeria particularly, speakers are more motivated to have their achievements reeled out during the introduction stage. Their achievements here are in areas of educational attainments, qualifications and key positions held. If it is too brief like one minute that you suggested, it will not be exciting at all in this environment. The Speaker will feel that you do not acknowledge is achievements. I think there is environmental difference as to what the audience and the speaker expect. I have attended conferences outside Nigeria, and I saw where speakers were introduced say moderately for about 5 minutes. The same is the case in India too where most of the speakers like to be introduced vividly and grandly. Hope they read this useful article and modify their expectations..
What a great article. This can make a huge impact to get the audience excited about the speaker or not. Thanks for the article – very informative. I would make my number 1 item, REMEMBER, IT’S NOT ABOUT YOU! Afer reading this article, I was very surprised. I attend many conferences, lectures, and speeches, in my profession. In almost all cases, the introduction odf the speaker has included the part of step number 11 that one is suppose to NOT do. That said, it never has seemed to uninterest the audiences. I enjoyed this article and look forward to more. I agree, Dianne. It is extremely common for introductions to be very lengthy and include numerous non-relevant details. Still, that does not make it right. i actually stumbled onto this page as a speaker who was asked “how should i introduce you”. This was very helpful for focusing on what to write and what information is important at that moment. Andrew, I’ve never seen the topic covered so well, and I’ve been a toastmaster for many years. Great job! My question is if the speaker gives you an intro, do you just present it as given? I’ve had an emcee take my carefully crafted intro and paraphrase every sentence. Boy, was that annoying! Yes, a paraphrased intro can be frustrating. If the speaker gives you a prepared intro, and it follows all of the advice in the article, then I would probably present it as given. If the prepared intro violates one or more of the guidelines, or if it didn’t feel quite right for some reason, I’d chat with the speaker about finding the right “fit” to both fit their talk, and the event as a whole. Occasionally, there are strategically placed keywords or phrases in a prepared intro that are part of the speaker’s presentation message or brand, and they would be upset if they were changed. On the other hand, sometimes the intro can be modified. As I said, talk to the speaker and work it out ahead of time. 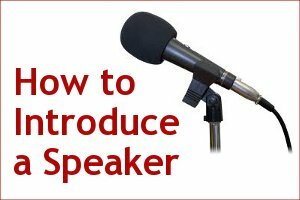 Great post covering all the main points about how to introduce a speaker. What I’d ask you, is what would you recommend for a first timer? 16 points can be a bit intimidating. For me, I think over the speakers we’ve had at our public speaking club, and the two most important lessons from your list are (1) be enthusiastic and (2) build to a climax (so everyone knows its over). If I’ve got a rookie, giving it a go for the first time, what directions would you give them to make their introductions crisp? Regarding transition and “shake hands before your leave”, is it ok for introducer to sit or stand behind or to the side of speaker when he/she leaves? I’ve seen introducers do this and it is a distraction because they are visible and don’t sit still. Why not require introducer to sit in front row as a rule unless there is a dais with honorees, etc.? Is there a rule on this? 1. Do I have to shake his hand before and after his speech? 2. After introducing him, do I have to leave him at the lectern and sit on my assigned sit or stand behind him while he talks? You caught me… it was unintentional (but very ironic). I’ve updated to replace the word with “blunder”. Great post! Informative and to the point. I would like to ask what a speaker should do if the person who introduces him or her makes a mistake in his or her name? Thus, if the name of a speaker was not pronounced correctly, should the speaker correct it or make a joke about it?Also, can anyone provide a link to an example of a proper introduction? Thank you. Well said – I learned this 3 step approach when I was working for the Dale Carnegie organization and have used it for over 3 decades — it works people – it works – and they will remember you as much as the speaker. By not preparing to introduce a speaker is like saying the speaker is not worth the time to get to know, which sends signals to the audience with the same message, why should they listen to someone whose introduces doesn’t event care about? Take the time, learn your speaker, highlight the importance and significance of that speaker and build up the speech for the audience to be WOW’d! This is great advice I need to share with our audience on the Speaking of Wealth Show (speakingofwealth.com) where we talk to several successful authors and publishers, along with writing tips and advice to better their skills, just like you. Thanks again for the blog! Iam aboutto introduce my son on sunday at church for the speaker of the hour. Thanks this article is very informative and guidingly useful in my incoming and future conferences and events.. God Bless.. I have found many impact full speeches had an impromptu(spontaneous) introduction as that had great relevance. Whats your take on that ? i live in a university town and get to attend many lectures given by the famous and not so famous. i am always amazed and embarrassed by the lack of good introductions given to many of these guests. i cringe so often, and i wonder why few find it important to learn good speaking techniques in this area. keep up the good work and hopefully you can get the word out. Your report today is very timely as I am one of several Toastmasters coaching our future world leaders who in this case are top high school students who will, after several months of coaching, conduct the 13th Annual 4-DAY YOUTH LEADERSHIP CONFERENCE held at the U.S. Space & Rocket Center in Huntsville, AL, for about 90 to 100 top students from several states. As a long time Toastmaster who joined as a Toastmistress when accidentally attending a meeting in Bangkok, Thailand, back before Toastmasters had the good sense to admit females, my reason for joining had more to do with having an opportunity as a journalist to meet people from 9 different nations and all walks of life share their backgrounds and cultures while learning to better their communication skills. It took 29 years and a cause outside myself to spur me to make speeches so I might learn to better influence people to support issues I thought important. And having the opportunity to coach these outstanding youths who will soon be leading our country and the world in which our offspring and theirs will live is certainly one of them. As one of the major duties the teens we are coaching will have is to introduce themselves AND outstanding leaders in the fields on which the YLC is based: Leadership, Patriotism & Heritage, and Free Enterprise, your advice on how to give introductions is very timely and I am happy to share it with these youths, areaToastmasters and the M.O.W.W. members who are sponsoring the conference. In general, the importance of introductions is underrated. They are the first step into true engagement between speakers and participants. And writing the introductions help the moderator ‘get into the meeting’. There’s one element I’d like to add to number 1, the three core questions: why is this speaker relevant at this moment in the meeting? This goes to the meeting design, and helping the participants see the logic in that. It may be for instance, that the first speaker showed there is a problem and that the second one adresses how to solve it. That’s a good point. If there is an important relationship between speakers at an event, then a good introduction would highlight that relationship. Since our goal is communication, the tips you have outlined help the person doing the introduction, the speaker, and the audience. I am teaching a Leadership Training Class, one of the sessions is “Introducing a Speaker.” I am using your article as a hand out, of course giving you credit and including this site, I hope you don’t mind. It is well written. Do the same pointers work for non speaking introductions? I am an introducer for lots of different types of presenters – singing groups, worship leaders, drama groups, etc. Shoukd I follow the same points? For the past years, I have made a lot of mistakes when introducing a speaker, but as I have learned these tips, I will do my best. I find the instructions very educative, thanks. Thankyou for your article i particularly appreciated you bringing out the concept of building to a climax and decreasing the importance and va-va-voom factor of the person introducing. Its not about me , its about the person I am calling up. Also the reminder to be interested (truly or superficially) is normally forgotten. Introducing a speaker is easy, especially if you know the information regarding the person, It takes confidence, relax and enjoy the moment.